“in-stock” books have purple cubes. A. The Eddas  It is imperative for any who are truly interested in Ásatrú and wish to learn about the gods and goddesses to read the Eddas. The Elder Edda is more important in my eyes, and is the most basic source for a Heathen to read. These two sources should be the first and foremost in your studies. Hollander, Lee M. The Poetic Edda Austin, University of Texas Press, 1994.——Hollander’s translation is probably the most available on the market, but I feel has sacrificed much of the direct meaning of the poems for the sake of recreating a modern English structure that is alike the Old Norse. Larrington, Caroline. The Poetic Edda Oxford, Oxford University Press, 1996.—— The Larrington translation is fairly new, but it is also very available.It takes a more direct approach to the translation, and though it hasn’t the poetics of Hollander, the literal translation provides a clearer look at the Lore. Young, Jean I. tr. The Prose Edda: Tales from Norse Mythology Berkeley, University of California Press, 1984.——This edition only includes the Gylfaginning, and though that is where the stories and information of most mythological significance are located, the other sections of the Prose Edda are also very helpful in later Heathen life. Faulkes, Anthony tr., Sturluson, Snorri. Edda Vermont, Everyman Press, 1995.–This is an excellent translation, available, containing all of the sections of Snorri’s Edda and it is very inexpensive. Mattingly, Harold tr. Tacitus. The Agricola and the Germania New York, Penguin Books, 1970.—— The Germania is the most important source of this type. Tacitus, though he was never a first-hand observer, describes some of the beliefs and customs of the early Germanic tribes. It is written by someone who never had contact with the tribes, so it must be taken with a grain of salt, but it is well worth the read. C. Sagas — There are many sagas and some are difficult expensive to obtain. If this is a problem, try looking into your local university library, or visiting the OMACL (On-line Medieval and Classical Library) in order to download them in public domain versions. Monsen, Erling tr. Snorre Sturlason. Heimskringla, or The Lives of the Norse Kings New York, Dover Publications, Inc.
Ynglinga Saga: attributes the founding of nations to the gods, who are portrayed as earthly kings whom the “ignorant” heathens venerated as gods. Hacon the Good: Raised in England, Hacon comes to Norway a Christian, but his advisors guide him back to the heathen ways. Olaf Trygvason: aka Olaf the Traitor. Forced Christianity onto the Norwegians. The heathens are defeated, but there are some inspiring tales of fidelity to the old gods in the face of persecution and torture. Also contains some intriguing descriptions of heathen customs Olaf wanted to suppress. St. Olaf: Another conversionist with horrible means and ends. At least he is defeated in the Saga. Eyrgyggja Saga: Includes the most complete surviving description of a Norse hof, which is maintained by a Thorsgoði (priest of Thor). Hrafnkel’s Saga: The story of Hrafnkel, Freysgoði. Njal’s Saga: The greatest saga of them all. Iceland’s decision to convert to Christianity is part of one of the major episodes. Egil’s Saga: Much is to be learned from this poet, rune worker, and warrior. 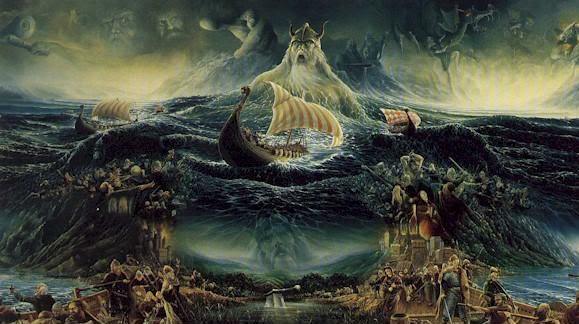 The Saga of the Volsungs: The Norse version of the Siegfried myth. Translated by Jesse Byock; published by the University of California Press: Berkeley;. Of course, one should read Beowulf. The Penguin translation is easy to find, but prosaic and lifeless; a number of good, poetic translations are around. I still suggest picking up a copy of the Everyman Library’s Anglo-Saxon Poetry. Though it is in prose translation, it contains a comprehensive collection of Anglo-Saxon source material including “The Battle of Maldon” and “The Seafarer” which are interesting to Heathen readers. II. Archaeological and historical works  Modern scholarship. H.R. Ellis Davidson, Gods and Myths of the Viking Age; Bell Publishing: New York;. —Has also been published under the title Gods and Myths of Northern Europe. The best readily available book on modern academic views of Norse religion. P.G. Foote and D.M. Wilson, The Viking Achievement; Sidgwick And Jackson: London;. — Focuses on the whole of Viking culture (not just the raids and mayhem). Comprehensive. Gwyn Jones, A History of the Vikings; Oxford Univsersity Press: Oxford; . —Focuses on the historical changes that occurred during the Viking period. Manages to be readable and scholarly, exhaustive and entertaining, all at once. A fine book. R.I. Page, Norse Myths; University of Texas Press: Austin;. —Short but useful introduction to Norse mythology. Page doesn’t seem to like the Vikings much, yet he is fascinated by them. Gale R. Owen, Rites and Religions of the Anglo-Saxons; Dorset Press;. –A good source of information about Anglo-Saxon heathenry. David Wilson, The Anglo-Saxons; Pelican Books;. —A basic introduction to Anglo-Saxon culture. Ralph W.V. Elliot, Runes: An Introduction; St. Martin’s Press: NewYork; —A nice introduction to runic history and inscriptions. R.I. Page, Reading the Past: Runes; British Museum Press: London; — A scholarly work, shorter and more skeptical than Elliot’s. Gundarsson, Kveldulf. Teutonic Religion: Folk Beliefs & Practices of the Northern Tradition. St, Paul, MN, Llewellyn Publications, Inc;. Great reading for ages 12 and up is: a series of books called the Tales of Alvin Maker by Orson Scott Card. This series is not specifically about Asatru, but focuses on earth based religions in America and American Folk Magic. These books show what life might have been like if America was still steeped in the occult, magick and a thriving Folk Religion. You will not want to put them down. We based an entire home-schooling unit on them, and we adults loved it as much as the kids.